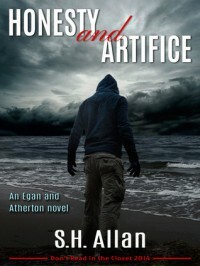 My most recent story is a gay romance action/thriller called Honesty and Artifice. It's available free from the MM Romance Group website. Boaz Egan never expected to find another human being on his empty beach, especially one nearly dead. 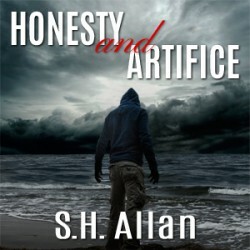 After years of isolation and secrets, he's unprepared for the feelings that Eric Atherton awakens in him. While Eric recuperates, the two men grow closer, and it doesn’t take long for Boaz to begin to question whether his reasons for remaining alone are good enough. But Eric has secrets of his own, ones that bring grave danger, and could end what has been building between them, maybe their very lives. For the men to know if they have a chance together, they'll have to brave their fears and face demons from the past. In the lonely and vast ocean waters of Alaska, the two men only have themselves to rely on. Can either man trust the other enough to survive the coming storm? Or will Boaz's one chance for love be over before it even began? I found him in the edge of the surf one morning, on one of my many solitary treks down the beach. Naked, battered, unconscious— just another bit of discarded flotsam on the sand.